You may be a young practitioner or an experienced M.D. planning to start own private clinic. In that case, you must ensure your new clinic’s maximum visibility amongst people. New clinics can use their medical logos to create a great first impression on viewers. 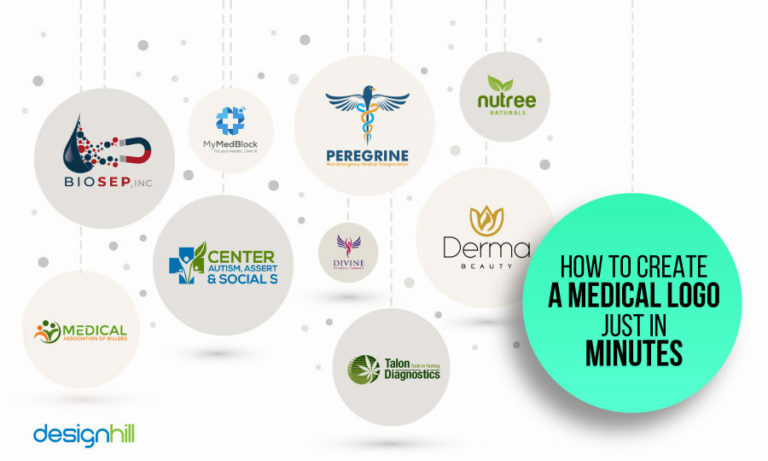 If a medical company logo is unique, it conveys the right message of quality treatment to patients. Nobody expects a medical practitioner to have some designing skills. Creating a professional logo has absolutely nothing to do with learning medical science. So, a doctor is not supposed to handle the design issues. Nevertheless, a newly established clinic may not be financially sound. This means that the clinic should be saving money on its marketing campaign. Therefore, it is important to find out ways to create medical logos in quick time. Such ways to design logos are essentially cost-effective as well. They help save money on hiring an expensive designer as you can create the logo on your own. Keep this glaring fact in mind that your new clinic or hospital will compete with dozens of other healthcare facilities. There are already many small and big medical facilities even in a small city. Hence, medical logos are the main visual identities that help draw people’s attention to your new clinic. Before setting out to design medical logos, first know its purpose or message. Every time you design a logo, it has to have a purpose. It intends to address its target audience and expresses their aspirations as well. The message of a practitioner’s logo depends on the clinic type. For example, a dental logo’s message will be different from that of an eye specialist clinic’s logo. Therefore, find out what message your logo should convey to the target patients and general people. The message may be of a high quality of treatment your clinic ensures. Or, you may want to highlight your medical services. Just think of values you want to pursue as the practitioner. Your logo should convey how you want your patients to feel when they visit your clinic. In addition, the logo should be a reflection of your speciality as a practitioner. Once you know your message, the next step is to pick the right icon in your field of medical speciality. These icons for hospital logos help people identify with your profession and your specific field. You can choose a traditional medical icon such as a stethoscope. Or, find out new icons that reflect your specialization. Looking for a medical logo design? Your target patents are modern people whose design taste is different than the people before them. For example, people do not always like classical writing styles or retro designs of yesteryears. They may not get a good impression of a design if it looks outdated. So, make sure that medical logos look modern. It would be good to follow some design trends that people like to appreciate. When following a trend, try not to be too trendy. A disadvantage of trends is that they fade away in a few years. Therefore, create a logo that is trendy but can last for many decades. While you intend to design modern and trendy medical logos, keep it simple as well. Simplicity is the key to the success of logos when it comes to drawing people’s attention. Remember logo should be addressing a diverse audience made of different cultures and backgrounds. It is, therefore, advisable to design the logo with minimum use of lines, images, colors, typefaces, shape, and other elements. You should try to convey your medical facility’s brand message through a simple shape of the logo. Note that a simple logo is easy to understand. People can recognize it as a sign on billboards from a long distance. They can register a simple logo in their mid quickly due to the easy use of lines and colors. It would be good to stick to the use of clean fonts and geometric shapes for the logo. Medical logos typically have blue, green, and red as mostly used colors. In the medical field particularly, blue seems to be a favorite color. This color reflects knowledge, cleanliness, and above all trust. A reason for the use of green is that it evokes the feelings of growth. Finally, red is known for its quality of reflecting strength and passion. It is also a color for love and aggression. Therefore, consider such qualities of colors when choosing them for medical logos. Remember also that colors will express your message to the patients. For example, people usually fear to visit a dentist. Your logo can have some calming colors to convey a brand message of your clinic. Remember that colors play a key role in business branding. Another most important element to create a healthcare logo is the strategic use of typography. Generally, the designers are of the view that typography gives personality to a design. For example, rock music bands typically have very big letters in their logos. This they do to reflect their loud and bold music. Similarly, pick the legible typefaces that people can read clearly. If you use sans serif fonts, it will convey a friendly environment of your clinic. But a serif font will reflect a formal and professional approach of treatment you adopt. So, pick the right typeface depending on your brand message. After you are aware of your clinic’s brand message, colors, and typefaces, now you are ready to design your logo. Here, note that you do not have to hire graphic design services of a professional. Instead, you can create medical logos on your own without having design skills and experience. All you need to do first is to visit an online logo maker. It is a tool that you use to design your logo with the help of many useful features. One such tool lets you create your logo quickly without any outside help. When you visit a site that offers a free logo design tool, just follow the guidelines. These are templates that allow you to make your color and typeface choices. You can pick images, lines, and other elements as well. Make sure that you select the right icon for medical logos. Such templates have plenty of icons from every field. Then, select a layout as well out of many. You should choose the background also. The tool has drag and drops features. These features allow you to just drag colors, typefaces, icons etc and drop them into the right place on the healthcare logo layout in the template. The tools come with mockup features. The mockup tools let you test your logo against a variety of background. For example, you can have a preview of how hospital logos will look on your signboard, website, business card, advertisements, and so on. That is the only thing you need to do in order to create medical logos in minutes. Once you are satisfied with your selection of the design elements, you are ready to get the logo. Just hit the ‘submit’ or ‘finish’ button and you get your logo. You can download the finished logo that very moment and have it printed. Clearly, you do not have to hire a freelance graphic designer. There is no need for you to spend money heavily in creating the logo, especially in the initial phase of your practice. Now that you know how to create medical logos in quick time without any external help, consider one more thing. The medical logo design should make a lasting memorable impression on viewers. If that does not happen, then the whole purpose of the logo goes waste. Therefore, use the logo maker tool only after some preparation beforehand. What this means is that the choice of colors, typeface, icons etc should be already known to you. Of course, you make these choices based on a brand message of your pharmaceutical logo. If you are willing to wait for some more days to get your medical company logo, then think of outsourcing it. Here, sites like Designhill can help. This is a leading marketplace where business owners source various cost-effective design solutions. New clinics and even established ones can have their medical logos created quickly. They can use logo maker tools to design their logos on their own. But they should first know their brand message, identity, choice of colors, typeface, etc well in advance. Then, the tool lets you create a logo with drag and drop, easy-to-handle features.